Malcolm Lang Spencer, 79 of Mechanicsville, MD, formerly of Boston, MA passed away on April 5, 2019 in Charlotte Hall, MD. Born on October 29, 1939 in Boston, MA he was the son of the late Margaret Lang Spencer and Donald Spencer. Malcolm was the loving husband of Lois Marie Spencer whom he married on July 2, 2005 in the Charles County Courthouse, La Plata, MD. He is survived by his children; Morgan Lang Spencer of Pope, MS, step-daughter Angel Cole of Mechanicsville, MD, step-son Shawn Buckley of Port Tobacco, MD and 4 grandchildren. Also survived by his siblings Ambrose Spencer and Charles Spencer. Malcolm graduated from Buckingham Browne & Nichols Upper School. He also graduated from the University of Maryland with a Bachelor’s Degree in Business and Science. He moved from North Carolina to St. Mary’s County MD 2 ½ years ago. Malcolm was employed as an Operating Room Surgical Assistant/Technician for Southern Maryland Hospital and Civista Hospital for 18 years, retiring November 3, 2007. Malcolm served in the United States Army for 27 years from November 13, 1961 to November 30, 1988. His duty station was Walter Reed Army Medical Center, Washington DC. 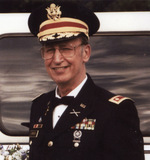 While serving in the United States Army, Malcolm was awarded the Bronze Star Medal, Army Commendation Medal, Armed Forces Reserve Medal, National Defense Service Medal, Parachutist Badge, Vietnam Service Medal, Republic of Vietnam Campaign Medal, Vietnam Civic Action Badge, Republic of Vietnam Cross of Gallantry, Good Conduct Medal Bronze, Clasp w/5 Loops, Army Achievement Medal, Army Service Ribbon, Overseas Service Ribbon, NCO Professional Development Ribbon, Expert Badges w/M-16 Rifle and Hand Grenade Bars, and Meritorious Service Medal. Malcolm enjoyed reading listening to music, the Theatre (plays and Operas), playing the piano, backgammon, and card games. In addition, he was a Wrestling fan and Boston Red Sox Baseball fan. In loving memory of my husband, Retired Major Malcolm L. Spencer, whom wrote this to his parents about the “Steel Helmet”. This is also dedicated to all soldiers who serve in Any War! My husband was a Great writer and story teller. We have set up a company base at the western end of this wide valley about 6 miles S.E. of Bong Son. From here two platoons go out during the day and two at nite. Since I have three F.O. teams (myself and my R.T.O. my recon, sgt. and a 4.2 in mortar F.O. and his RTO). I plan to rotate us so that we work 12 hrs. and are off 24. I guess you know who got the first full days rest. Tell Garka that his letter enriched the mind, uplifted the soul and gladdened the heart. I do so love the phrase “Volens Volens”. I hope all came out well for him at the hospital. Most of you out there in civvie-land have never seen a steel helmet or “pot” as it is called by the men in the trenches, and you probably never will. A lot of you may say, “Oh yes, that’s the thing the boys wear to keep their heads in one piece.” Of all its uses this is most definitely not the most important or even the most plausible. First, the steel helmet may deflect a B-B. It isn’t too awfully thick and bullets any larger than a .22 short will, I’m sure, (well, you can guess). Secondly, the liner inside the pot brings the rim of the pot level with one’s eyes so that only a small percentage of the cranium is protected! By now you are wondering does this hemispherical piece of tin junk have any use at all? But of course!! The most important and easiest to visualize is the steel pot’s use as a seat. Unless one is an oriental and can adroitly assume that awful squatting position which is very hard on the knees, one must find a seat to be comfortable. What is quicker than to reverse the position of the pot, drop it on the ground and sit on it. Remember to turn it sideways to reduce the instability of the thing. In this ease one is able to listen to services in the field, eat, be briefed and de-briefed, and in those quiet times provide a spot for quiet contemplation. Remember, too, to sit facing the sun. Shining from the rear onto the pot, the sun produces a sensation akin to having one’s derriere fried!. Have you thought of the problems that arise out of trying to keep clean. If you guessed that with the helmet liner removed the pot becomes a wash basin, you are 100 % correct. Some trifling problems are inherent in this use. If the pot is new and round and has not yet been dented by other clumsy riflemen swinging their weapons freely in the underbrush, then one has to either dig a small depression in the ground (this, too, can be accomplished with the pot) or surround it with rocks so it will not tip over midway through one’s toilette. If you’re not used to shaving in cold water the pot also can serve as a kettle in which the shaving water can be heated over a heating tablet. The soap scum and whiskers that remain inside after the water has been dumped, can be wiped out with the bright green camouflage cover which covers the outside of the pot. Always remember to dry it thoroughly after use or the few remaining ounces of wash water will drip quietly into your eyes and down your neck. The last and most misunderstood use of the steel pot is that of a hammer. A great many people vent their frustrations by smashing their pots against anything solid. This can be painful if you forget to remove it first. However, in the “off the head” position and in the hands of other than a manic depressive it can be a most effective sledge or hammer….. can be built, stakes pounded into the ground., etc. a word of caution, however. The prolonged and heavy usage of the pot in this fashion makes it difficult to wear. In fact, it is not unusual to see men banging away at their helmets in an attempt to complete the inversion of the rounded portion. Also, unless one is prepared to pay for this item, this use should be limited to emergencies or at least to the hours of darkness when it becomes difficult to see who is mistreating his equipment. Finally, it has been reported that while a certain soldier was in the midst of his bathroom business and because his weapon had been placed too great a distance away, his steel pot was used to subdue a V.C. who surprised him at his cathole. I feel this last must be apocryphal but who knows. At any rate, those ingenious men who finally invented the steel pot could not have envisaged the many and varied uses of the steel pot. All hail to ingenuity! Well, pretty spotty for a first opus but you can easily see the trend the others might follow. For instance, the SOCK, the SLING, etc. This correspondent remains your ever faithful son. To send flowers to the family of Retired Major Malcolm L. Spencer, please visit our Heartfelt Sympathies Store.